Are you allowed to pass on a solid yellow line? Are you allowed to pass on a solid yellow line? 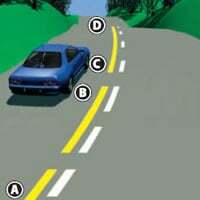 You can pass a car in this situation as long as you stay to the left of the yellow line. Your wheels must not cross the yellow line. This allows you to get past slow vehicles which would normally pull to the left to help you overtake, e.g. tractors. The yellow line is called a no-passing line and it's usually there because it's unsafe to cross the centre line. There might be a hidden dip or crest, or a corner that you can't see through. Or, it might have been an accident blackspot in the past and it is safer to not overtake there.